The Appeals Court said the plaintiffs were suggesting “an entirely new duty” not recognized by state common law. The Appeals Court further noted that there is no affirmative duty to inspect and repair public sidewalks or notify the city. In Massachusetts, cities generally have limited liability of $5,000 for personal injuries and property damage from defective ways, which also leaves plaintiffs who are injured with limited remedy. In 2009, a man fell on uneven sidewalk after leaving his office at the John Hancock Tower in Boston. He suffered a bilateral rupture of his quadriceps tendon. 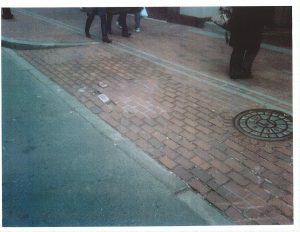 After the fall, the defendant, 100 & 200 Clarendon LLC, did make some repairs, with no attempt to seek reimbursement from the city of Boston. The man and his wife filed a lawsuit in Suffolk Superior Court in February 2012 and filed a motion for summary judgment in January 2014. The Supreme Judicial Court could now review the Appeals Court ruling and decide whether to extend a duty for sidewalks to private owners. Attorney Breakstone told Massachusetts Lawyers Weekly this would be a “baby step for the evolution of our tort law.” It is a widely accepted principle that businesses making a profit from the customers they attract onto their premises have to provide safe egress, he said. In 2010, the Supreme Judicial Court decision in Papadopoulos v. Target Corp. abolished the common-law distinction between natural and artificial accumulation of snow and ice. In Massachusetts, property owners are now responsible for clearing all areas of their property under the standard of “reasonable care,” regardless of whether they created the snow pile or if it naturally formed. Read the full article on the Massachusetts Lawyers Weekly website. Subscription required for access. Marc L. Breakstone has established a reputation as one of the top medical malpractice and personal injury lawyers in New England. His record-setting settlements and verdicts have earned him the distinction of being selected as one of the Top 100 Super Lawyers in New England and Top 100 Super Lawyers in Massachusetts. He has also been selected by his peers as one of the top medical malpractice plaintiff’s lawyers in the Super Lawyer balloting. In 2002, Attorney Breakstone was honored as one of ten “Lawyers of the Year” by Massachusetts Lawyers Weekly. More on Marc Breakstone. The Boston personal injury attorneys at Breakstone, White & Gluck have over 100 years combined experience handling personal injury and premises liability cases for those who have been seriously injured. If you have been injured, it is important to learn your rights. For a free legal consultation, contact us at 800-379-1244 or 617-723-7676 or use our contact form.